At the turn of the century (19th to 20th, that is) Bunker Hill in Downtown was what the English would call a “posh” area. It was not only a desirable living quarter, it also loomed above the lower parts of Downtown. The incline was (and is) short, but steep, which made people grumble just enough to let others see an entrepreneurial opportunity – and the Angels Flight was born. Then Angels Flight was dismantled in 1969. With the beginning of redevelopment of Bunker Hill from a run-down eye-sore to what it is today, it had to go. Fortunately it was not totally scrapped, but placed into storage; there it sat for 27 years, to be rebuilt and reopened half a block away from its original site in 1996. 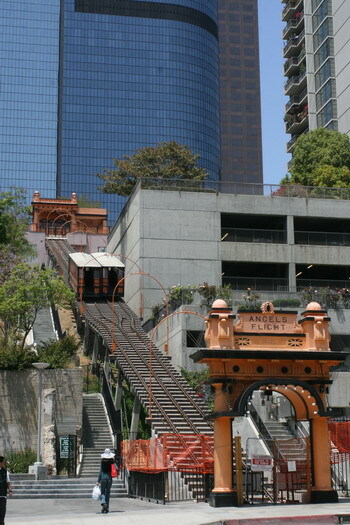 In October 2000 Angels Flight was added to the National Register of Historic Places. In February 2001 a serious accident happened – Sinai when approaching the upper terminus reversed and collided with Olivet coming up the hill. One passenger was killed, several others were injured and Angels Flight was put out of commission again. After lengthy investigations into the cause of the accident and an overhaul of the system the cars are back on the tracks again since the end of 2008. However, Angels Flight has not started to operate yet; hopefully, it will run again some time this year. And nobody has ever corrected the strange spelling. But then, how can one – after all, it is a historic landmark, spelling mistakes and all.